Great for large families or groups of up to seven, these newly furnished town homes feature brand new bedding, furniture, and décor. The master bedroom has a queen bed and Jacuzzi tub, and the guest room is furnished with a twin over queen bunk bed with another private bath. The large, open plan living room with sofa bed and kitchen are perfect for entertaining, complete with a large flat screen TV, dining for eight, a private deck, and another full bath. Crafted with earthy tones and rustic details, these town homes are aesthetically pleasing and spacious. 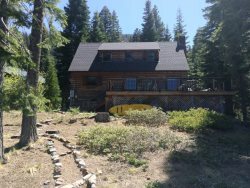 The complex is tucked alongside the Kirkwood Meadow and is mere steps from hiking, biking, cross country, and snow shoeing trails. In the summer natural landscaping complements the beauty of the scenery as colorful wildflowers dot the sweeping green meadow. With a prime meadow-side location, the Sentinels combine serenity with easy access to resort amenities. Each home is complete with a private deck, single car garage, and additional driveway parking. The downstairs mud room entry houses a washer, dryer, and boot warmers. Wifi and high end entertainment equipment make these town homes a great choice for those looking to stay connected on vacation with a touch of luxury. - Master Bedroom – Queen Bed. - 2nd Guest Bedroom – Queen/Single Bunk Bed. - Living Rom - Queen Sofa Bed. Large custom kitchen with the following amenities: dining table seating for 6, bar seating for 3, dishwasher, gas stove, microwave, coffee maker, basic pots and pans, dishes and silverware. 32" Flat Screen TV with Cable, DVD player and Stereo. Deck off kitchen - Gas Grill. Jacuzzi Tub in Master Bedroom plus No Recreation Center Access. 1 car garage with 1 additional outdoor parking space. Excellent cabin. Clean and cozy. We find everything that we need. Having 3 bathrooms in this cabin is definitely a plus! Any time we have needed help from the anyone at PPP, they were prompt and helpful. The condo is comfortable and nicely appointed. It is a little low on supplies - water glasses and wine glasses. MANAGER RESPONSE: We are in the process of stocking this unit with proper glassware.